Over one hundred thousand words of original fiction from USA Today bestselling writer Dean Wesley Smith. In this third volume, the full and complete science fiction novel Against Time, plus four original short stories, two ongoing serial novels, and many other features. USA Today bestselling author Dean Wesley Smith published more than a hundred novels in thirty years and hundreds and hundreds of short stories across many genres. He wrote a couple dozen Star Trek novels, the only two original Men in Black novels, Spider-Man and X-Men novels, plus novels set in gaming and television worlds. Writing with his wife Kristine Kathryn Rusch under the name Kathryn Wesley, they wrote the novel for the NBC miniseries The Tenth Kingdom and other books for Hallmark Hall of Fame movies. He wrote novels under dozens of pen names in the worlds of comic books and movies, including novelizations of a dozen films, from The Final Fantasy to Steel to Rundown. He now writes his own original fiction under just the one name, Dean Wesley Smith. 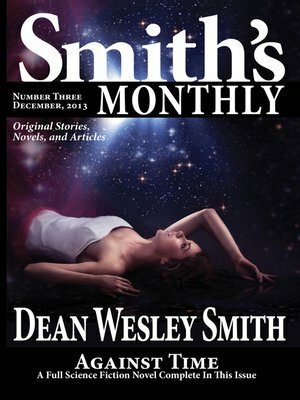 In addition to his upcoming novel releases, his monthly magazine called Smith's Monthly premiered October 1, 2013, filled entirely with his original novels and stories. Dean also worked as an editor and publisher, first at Pulphouse Publishing, then for VB Tech Journal, then for Pocket Books. He now plays a role as an executive editor for the original anthology series Fiction River. For more information go to www.deanwesleysmith.com, www.smithsmonthly.com or www.fictionriver.com.